New book, 186 pages. 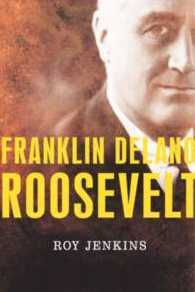 Roosevelts presidency was one of the most eventful in US history. He took office in the midst of economic crisis: the stock market had crashed, the banking system had collapsed and millions of Americans were unemployed. Galvanising the nation with his 1933 inaugural address, Roosevelt demonstrated an optimism and resolve that garnered huge support for the programmes that he called the New Deal. When he died some twelve years later, on the eve of victory in WW2, he had overseen an incomparable mobilisation of American industrial effort, might and will power. Roosevelt was the dominant president of the twentieth century and helped the United States become the most influentual power. This book enables the reader to comprehend how he accomplished this and why he still stands tall in our estimation today. This item was added to our catalog on Friday 01 December, 2006.